Martin Luther King Jr. Day is this month and a lot of kids are going to learn about the heroic things MLK did to fight for racial equality in the United States which also impacted the world. I was scrolling through Facebook one day and came across this photo that blew my mind. 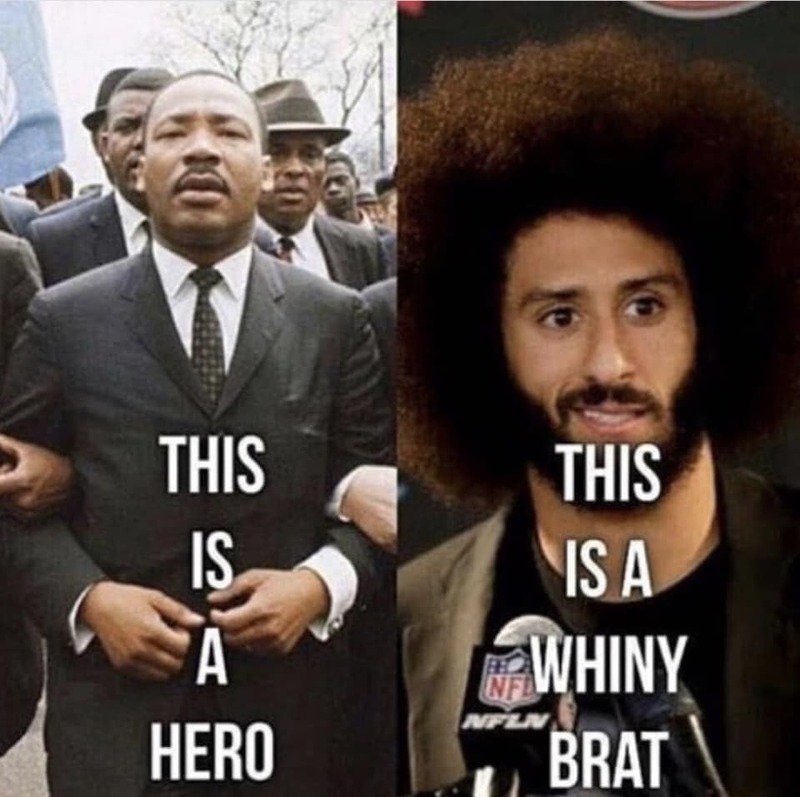 It is comparing Martin Luther King Jr. and Colin Kaepernick calling one a hero and the other a “whiny brat”. I was dumbfounded when I saw this. If you have taken a US history course you know all of the struggles the King, Malcolm X, Rosa Parks, and so many others had to go through just to fight for equal human rights. These activists were beaten, attacked, arrested and much worse for standing up for what was right. Today those activists are seen as heroes. But at the time when they were seen as rebels and “whiny brats” who couldn’t handle being treated differently. Well, I hate to break it to the creator of this image, but that is exactly what you have done to Colin Kaepernick. This young man, if you don’t know, is a San Francisco 49er football player who knelt during the national anthem (initially, he sat) as a protest against the racial inequality that is still present in the United States. I agree with Kaepernick when he says, “I am not going to stand up to show pride in a flag for a country that oppresses black people and people of color.” because he is not wrong. Our country is still oppressive and though it has come a long way, it still has a long way to go. However, many people thought that his actions were disrespectful to the flag, which is not the case. Before anyone starts that argument, I would like to point out that nowhere have I found a statement declaring it to be disrespectful to sit or kneel during the anthem or pledge. There is an entire list of what is disrespectful to the flag (https://www.law.cornell.edu/uscode/text/4/chapter-1), and it does state that during the Pledge of Allegiance, one is to stand and salute the flag in the appropriate manner, but I found nothing about what is deemed disrespectful to the flag nor the national anthem. I think of myself as a patriotic person in a patriotic family. I go out and vote because people died for me to have that right. I stay fairly updated politically so I am aware of what issues are going on. My dad, brother, and many more of my relatives have served in various branches in the military during varying events throughout US history. I love to learn about the United States and see how far it has come in such a relatively short amount of time. But as a patriotic person, it is also my duty to educate myself and others about our nation’s issues. Oppression is one of the many issues this country still has. Working together as a nation is what is going to fix it. 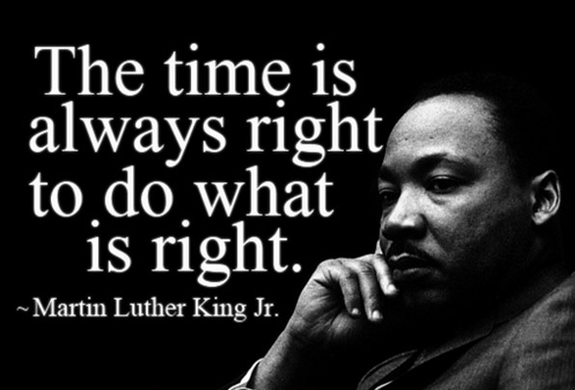 Martin Luther King Jr. is a heroic political activist who helped spread positive change around the world, change that needs to continue to happen. Colin Kaepernick is a political activist with the same ideals making that change happen. Both have used their first amendment right of freedom of speech and the right to protest. Both have and are working to make our nation better and push it towards a brighter future. Kaepernick is receiving similar wrath (to a lesser extent) than MLK, but it just goes to show how much growth and change we need to have. It may not be seen now, but hopefully, in the near future, Colin Kaepernick will be seen as a hero like those before him in the movement for equality. This Martin Luther King Jr. Day, be reminded of what he and many other heroes stood for and the impact they made on our country because yes, the nation has grown immensely, but it still has room to do more.